If you want to redo your living space or office but don’t have a large budget, short carpet rolls may be a great solution for you, especially if you have an open mind and are flexible. At Alexandria Carpet One Floor & Home Showroom, we are always well stocked with the types of carpet you desire, all at amazingly affordable prices. Should you want something even cheaper, we also have a variety of choices for short rolls. Although short rolls are carpet remnants, they may not be what you think. These aren’t oddly shaped leftover pieces disposed from other projects, nor are they poorly cut carpet rolls either. Instead, they are short carpet rolls sent directly from the manufacturers, and you’d be the first person to utilize them. Because our business has established many connections over the years, you’ll be able to choose from name-brand companies, such as Stanton, Robertex, and Karastan. Not only will you get to enjoy quality carpet rolls, but you’ll also get to enjoy highly discounted prices as well. These short rolls usually have price reductions of 50% to 70%, which means you’ll definitely get bang for your buck. You can also have our staff custom-cut these carpet pieces to fit your needs. Carpet is a great choice for floorcovering since it can help insulate your home and retain heat. We have access to Alexandria’s largest selection of woven wool and wool blends. This can be great if you have little ones, since everyone can walk around barefoot without feeling chilly on their feet. Because your home will naturally retain more heat with carpeting, you’ll also find a reduction in your energy bills, since you won’t have to run your heater as much. Not only does carpet keep you warm, but it can also help with noise reduction if you’re worried about sounds reverberating in your house. Your children and pets can run around and play without you having to worry about them disturbing your downstairs neighbors. Do you admire a certain type of carpeting but want it as a rug? You’ll be pleased to know that Alexandria Carpet One Floor & Home Showroom can do that for you. When we cut remnants off short rolls, take advantage of those pieces and turn it into a rug or functional piece. Our in-house team members are experts at binding and serging carpet, so speak to them about creating a piece for you. They’ll answer any questions you may have about binding and serging, and help you determine which is right for you. After they create the rug for you, our team members can also provide you with synthetic padding called “Super Move Not”, which is slip-resistant. By keeping your rug in place and free of wrinkles, you can prevent accidents from happening in your home. You may not think about it much, but the flooring you choose for your home or business is extremely important when it comes to durability and comfort. Choosing one material over another can mean all the difference when it comes to your finances and the tone you want to set for the environment. To help you find the perfect flooring option, we’ve listed out a few of the most popular choices, along with a few pros and cons about the material type. Your situation will vary, of course, so it’s always best to contact a local flooring company if you have questions! Carpet, the most common type of floorcovering, is a flexible and durable option found in all types of properties. If you’re looking to keep your family warm, carpet is a good option, as it provides insulation as well as noise reduction. The soft fibers are pleasant to walk across barefoot, especially during the winter. Carpet is also very easy to install, which means you won’t have your daily life disrupted very long before it’s ready. As one of the largest flooring contractors in the area, our business is always fully stocked with any type of carpet you may need, including short rolls. These are carpet remnants that are highly discounted, and you can pick some up to spruce up your rooms. The two main types of wood flooring include solid and engineered hardwoods. Hardwood flooring is a durable option, just like carpet, and it is a unique option since no two boards look the same due to the natural wood in them. 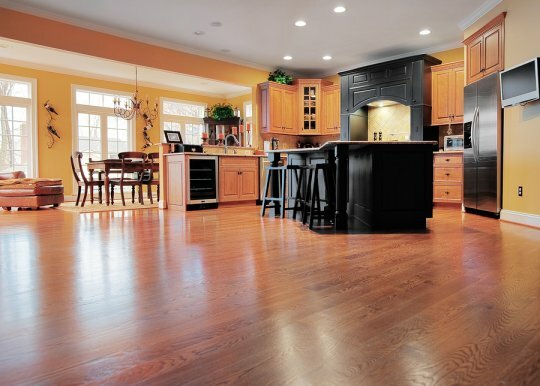 Hardwood flooring is versatile — both modern and traditional homes benefit from its beauty. Because hardwood boards can be made from many types of wood, you can add an organic feeling to your rooms by choosing from a range of colors, including everything from pale Southern Yellow Pine to dark Black Walnut. If you already have hardwood flooring in your home but it’s looking a bit lifeless, our team can do hardwood refinishing for you. We’ll bring back the original beauty and luster of your flooring. If carpet and wood aren’t the right choices for you, we do have other flooring options available. They include tile, vinyl, luxury vinyl tile, laminate, and natural stone flooring. Each of these types of flooring has their own unique benefits, such as cost efficiency, durability, and beauty. If you want to know more about these other types of flooring, come down to our showroom to see them for yourself and to ask us any questions you may have. At Alexandria Carpet One Floor & Home Showroom, we offer a wide range of flooring options at affordable prices, whether you’re installing new flooring or updating your existing flooring. Engineered Wood Floors vs. Solid Wood Floors: Which is Better?